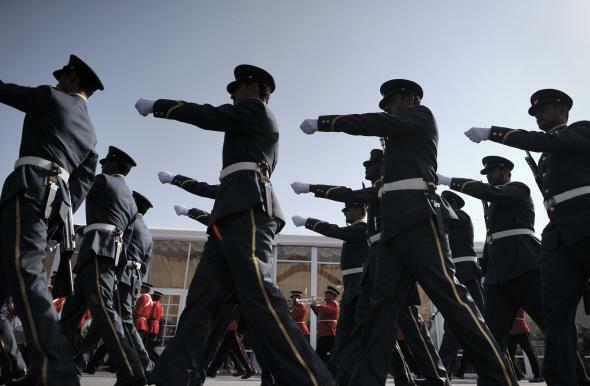 Bahrain’s Honor Guard parades at the opening of the Bahrain International Airshow in 2014. The U.S. State Department today announced that it is lifting restrictions on military aid to Bahrain, which were put in place after the government crackdown on protests during the 2011 Arab Spring. The U.S. will once again provide anti-tank missiles and Humvees, and the Bahraini government will now be able to request additional arms. It was probably only a matter of time. Bahrain is home to the U.S. Navy’s Fifth Fleet and supports the U.S.-led air campaign against ISIS in Syria, which included the Royal Bahrain Air Force’s first-ever combat missions. Tensions reached a high point last summer when Bahrain expelled U.S. Assistant Secretary of State Tom Malinowski after he met with members of a Shia opposition group. Malinowski returned to the country last December. The Obama administration has been gradually backing away from the restrictions placed on assistance to autocratic Arab regimes, whose support is seen as vital in the ongoing campaign against ISIS and other extremist groups. The administration resumed assistance to Egypt—the world’s second-biggest recipient of U.S. military aid, after Israel—in March, having suspended it following the coup that overthrew democratically elected President Mohamed Morsi in 2013. That decision was made despite little evidence that human rights conditions have improved in Egypt. An Amnesty International report released Tuesday charges Egypt with imprisoning a “generation of young activists” in a crackdown on dissent that has seen more than 41,000 arrests and hundreds of death sentences, including for Morsi himself.